With the help of seasoned agriculturalists, we put forth a diverse range of Healthy Pulses. These eaternal organic pulses and organic dhals are processed at our state-of-the-art facility. Thoroughly cleaned, meticulously graded and soundly packaged by our team, these dals are then made ready for retail and bulk sales. Customers are given a choice over standard and vacuum packaging, and can order up to 25 kg in one packaged unit. 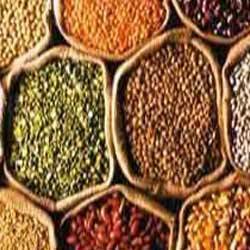 The dals that we provide include toor, chick pea, masoor, chana, urad and kidney beans (rajmah). With an exemplary track record of past 16 years, we have acquired a long trail of satisfied clients. Our range of products comprise Handicrafts & Handmade Items, Ready-made Garments, Leather Goods, Natural Herbs, Agricultural Products and Household Items. The range of decorative items, garments and leather products are appreciated for beautiful and unique designs, great finish, varied shapes and sizes, exuberant colors and perfect fitting. Whereas, our food and household items are known for fresh and pristine state, great flavors, efficiency and user friendliness. There is a great demand for our products in diverse kinds of markets because of a versatile nature. Our products can be used in industries and sectors like textile, food & beverage, agriculture, animal husbandry and private households. We are a customer centric organization, which works with clients as its basic concern. All our products are manufactured and processed at a hi-tech facility, and are provided to the customers at cost-effective prices. With 'Value for Money' as one of our motto, we provide added advantages like a up-to-date packaging service. Our entire team consists of certified and experienced personnel, who work around the clock in order to achieve optimum clients' satisfaction. It keeps updated with latest market trends in order to understand and implement changes in the production process. Adherence to international standards of quality has helped us in garnering a far-flung clientele that spreads across the entire globe.